A highlight weekend for American road racing, the Watkins Glen track comes alive with the competition of the Grand Am Rolex Sports Car Series as well as the NASCAR Sprint Cup and Nationwide Series for 2011. 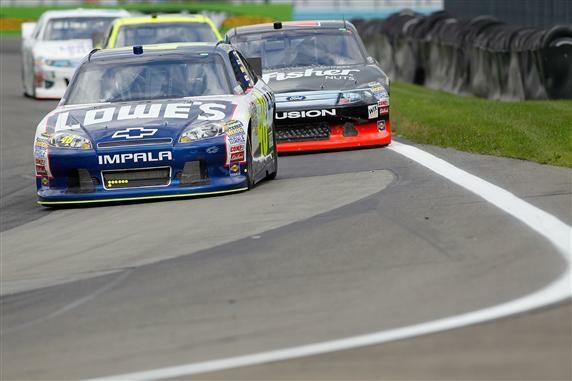 A busy weekend at the 2.46-mile Watkins Glen road course in lower New York state, the track time for the top-level NASCAR Sprint Cup Series gave the teams only two practices for Sunday's Heluva Good! Sour Cream Dips at the Glen. Both occurring on Friday, 46 NASCAR Sprint Cup machines are set to compete for 43 spots in Saturday qualifying. Despite the rich contingent of road racers making limited series starts, Kyle Busch conquered the lead position in practice session 1 at Watkins Glen. Piloting his Joe Gibbs Racing #18 Toyota Camry, Kyle Busch flew to a 1 minute, 1.24 second top time. Recently resigning with to drive the 2012 season in the #42 Chevrolet for Earnhardt/Ganassi Racing, Juan Pablo Montoya grabbed second fastest time. Montoya returns to the Watkins Glen race as the reigning NASCAR Sprint Cup race winner of the 2010 event. Third through fifth in the initial NASCAR Sprint Cup Series practice at the Watkins Glen track were stock cars driven by AJ Allmendinger, Ryan Newman and Brad Keselowski. Honourable mentions for fast times in the session also goes to Jeff Gordon who's 7th fastest, Dale Earnhardt Jr capturing the 11th quickest time and Andy Lally who drove his #71 TRG Motorsports Ford to a 15th fastest time. In the second practice session, Tasmania's Marcos Ambrose reached for the top of the NASCAR Sprint Cup Series time charts. The #9 Richard Petty Motorsports Ford Fusion was guided around the 2.46-mile Watkins Glen track in 1 minute, 9.67 seconds. Winning Saturday's NASCAR Nationwide Series event for the past 3 years, Ambrose is still hunting for his first Sprint Cup Series victory. In 3 previous Sprint Cup Series races at the Watkins Glen road course, Marcos Ambrose owns 3 top-five finishes. Following Ambrose's fastest time in the second and final practice for Sunday's Heluva Good! Sour Cream Dips at the Glen, Kurt Busch, Carl Edwards, Brad Keselowski and Martin Truex Jr collected top-5 speeds. Committed to drive the #2 Miller Lite Dodge for the NASCAR Sprint Cup race at Watkins Glen, Brad Keselowski is still nursing a angle injury suffered two weeks ago testing at Road Atlanta. Likely to go the distance in the 90-lap Sunday event, Keselowski is giving up his #22 Dodge in the NASCAR Nationwide Series to Penske Racing teammate Kurt Busch. After setting top time in the first Watkins Glen practice, Kyle Busch's #18 Joe Gibbs Racing Toyota was found in 16th place. Other drivers who showed a larger drop-off on the practice standings sheet between the two sessions were Kevin Harvick, Dale Earnhardt Jr and Matt Kenseth. It should be alluded stock cars dialing in race setups rather than for top qualifying speed. Qualifying for the Heluva Good! Sour Cream Dips at the Glen race will start at 11:40 am Saturday.